The Recipe: Chunks of tender beef kabobs cooked on the grill where an almost-sweet glaze forms on the surface of the meat, we call it "meat bark" and it's irresistible! On the side, serve Grilled Zucchini Kabobs and Grilled New-Potato Kabobs. The timing is perfect: the zucchini go on first, then the par-boiled new potatoes and finally the beef kabobs. In twenty minutes, they all come off at the same time, perfectly cooked! Great party food but easy enough for a weeknight supper too. This is the last of new "Summer Easy" recipes for 2014. It's been fun! Here you go, one of my very favorite meals for the grill! Just prep everything in the morning, chances are good you can make the whole meal from pantry ingredients. Then start putting the food onto a hot grill about 20 minutes before serving. Yes, it really is “that easy”. GRILLED ZUCCHINI KABOBS Slice zucchini and yellow squash cross-wise into about 5/8-inch thick rounds, thick enough so the skewer will go through without cracking the round. Brush both sides with olive oil, sprinkle with salt and pepper. Put on the grill about 10 minutes before the Easy Beef Kabobs, turn once. GRILLED NEW-POTATO KABOBS Par-cook small red potatoes in well-salted water until nearly done. Drain and when cool enough to handle, run skewers through the potatoes. Put on the grill about 5 minutes before the Easy Beef Kabobs. ALANNA’S TIPS Because small pieces of meat cook so quickly, Easy Beef Kabobs are best suited for a tender cut like sirloin or even tenderloin. Once we tried stew meat: it tasted good but many pieces were decidedly chewy and less flavorful, nothing like the tender pieces we’ve become accustomed to. I like metal skewers better than wood ones but if you have wood on hand, use them of course. Soak wooden skewers for 30 minutes or so but I find soaking makes little difference, both soaked an unsoaked skewers catch fire on the grill. 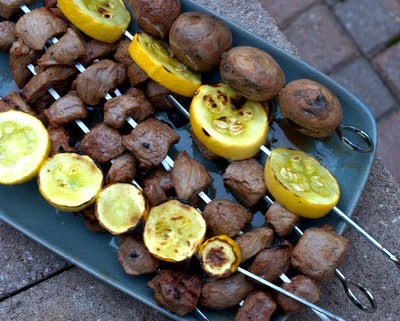 Easy Beef Kabobs make great party food! 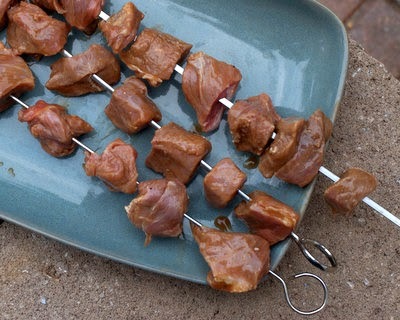 Just cut the meat pieces one-bite big and after cooking, pull them off the skewers onto a platter with toothpicks handy. Easy Beef Kabobs are excellent hot from the grill but even cooled down, taste really good. Here, I serve them off the skewers in a big bowl in the middle of the table. This might make it a little too easy because here's what happens: we keep sticking our forks back into the bowl! Sorry, oven cooking is not recommended, the marinade just doesn't form a glaze in the oven. The meat pieces do cook but just aren't special. Kitchen Parade is written by second-generation food columnist Alanna Kellogg and features fresh, seasonal dishes for every-day healthful eating and occasional indulgences. Quick Suppers are Kitchen Parade favorites and feature recipes easy on the budget, the clock, the waistline and the dishwasher. Do you have a favorite grill meal that other Kitchen Parade readers might like? Just send me a quick e-mail via recipes@kitchen-parade.com. How to print a Kitchen Parade recipe. Never miss a recipe! If you like this recipe, sign up for a free e-mail subscription. If you like Kitchen Parade, you're sure to like my food blog about vegetable recipes, too, A Veggie Venture. Follow Kitchen Parade on Facebook! MARINADE Mix all ingredients in a large, flat container. MEAT Cut meat into similar-size pieces, cutting along muscle lines, removing fat, dropping pieces into marinade when cut. Stir to coat, make sure all pieces are submerged in the marinade. Cover and refrigerate for <<< at least six hours >>> (no less, trust me on this!) and up to 24 hours. SKEWERS Slip meat onto skewers, don’t jam them up, leave breathing space in between, this helps the meat cook evenly. TO GRILL Cook kabobs on a medium-hot grill for about 10 minutes, turning once, until still slightly pink in center or to desired doneness. SERVE hot from the grill or at room temperature. NUTRITION INFORMATION NUTRITION INFORMATION (Assumes half the marinade is absorbed into the meat, yes, I watch and measure these things!) Per Serving: 194 Calories; 6g Tot Fat; 2g Sat Fat; 60mg Cholesterol; 342mg Sodium; 5g Carb; 0g Fiber; 4g Sugar; 24g Protein. 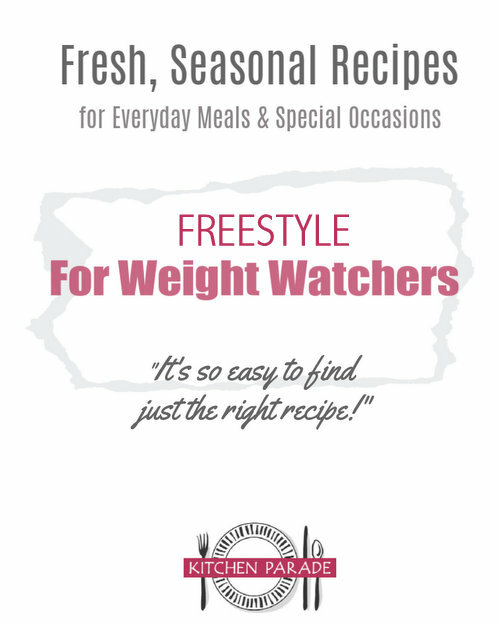 WEIGHT WATCHERS POINTS WW Old Points 4, WW PointsPlus 4 CALORIE COUNTERS 100-calorie serving = half one serving. This recipe has been 'Alanna-sized' with reductions in fat. I just love cooking tips that are easy to remember and easy to perform! These are two of the very easiest ways to cook perfect kabobs. 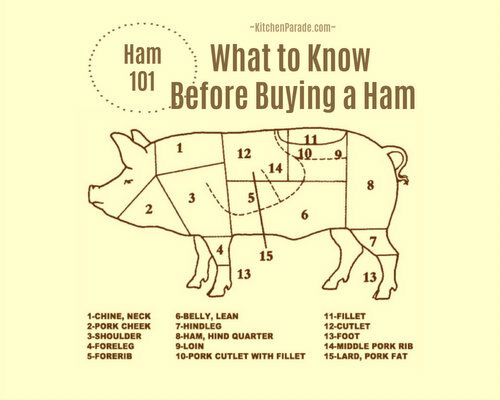 Top Photo – Leave space between the meat pieces. Note too how the pieces are quite close in size. Bottom Photo – Grill different kinds of vegetables separately, cooking each one until done. For zucchini, cut the zucchini into rounds of equal thickness, then run the skewers through the sides.